Yet Emiko said it: don’t spread yourself too thin. Do not use all of your strength committing yourself into too many activities, otherwise at some point all your energy will slip out of your hand, scattering in thin streams and losing the usual sharp incisiveness. When someone knows you so well is rarely wrong, and in fact it happened. I’m living a beautiful and intense time, crammed of things I want to do, see, learn, study, of friends who deserve my undivided attention because they are about to move away, too far away to answer the last minute call to cook together a winter and cosy lunch during one of the hottest days in August (with the fireplace roaring in the background, just to say). And so I find myself sitting at my desk in the evening with the cool breeze that finally comes in from the ajar window, staring blankly at my to-do list scribbled down on a sheet of paper, list that increases instead of decreasing day by day. I have realized that when my energy slips away from my hands I am likely to lose the pleasure in doing what I used to do with a shudder of emotion: things such as writing a new post, just so to speak. If you enter into the cook – shoot – write process, the game is over. Where is the poetry? where the emotion? where the study and research? where is the pleasure of sharing a good recipe that is also a means to tell something about my life? 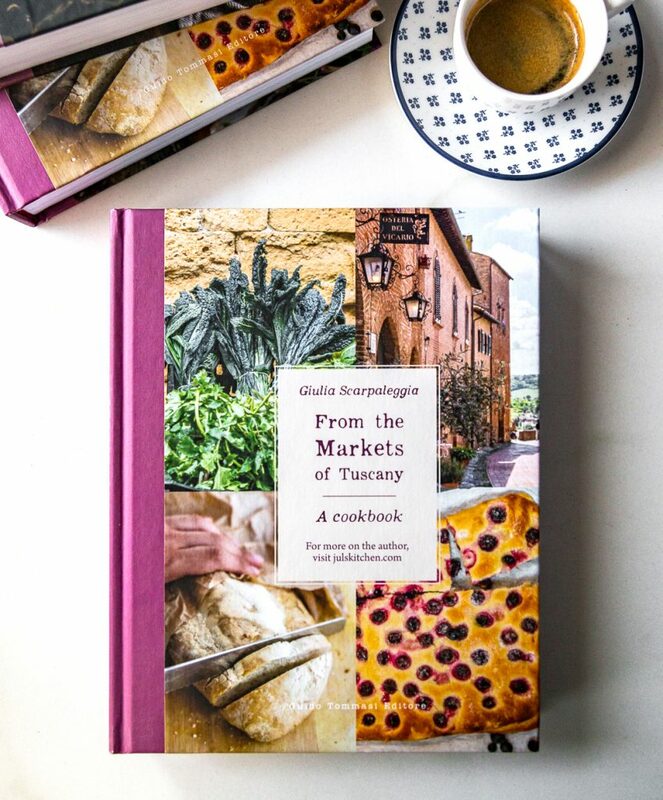 If you have visited my blog a few times, I think you have had the feeling that, to me, a recipe involves a whole world, my world: it would be a shame not to be able to describe that world where ingredients and herbs are intertwined with life stories and passion. So it is definitely the right moment to enjoy some precious me time, to go to sleep early at night, huddled under a Moroccan silky blanket, with the bedroom window wide open, to let into the balmy early autumn air. It’s time to paint my toe nails with glossy dark blue shades, even though in a few days I’ll be forced to replace my summery flip-flops with the red flat shoes, because I know it is there and it makes me feel like a sparkling young girl. It’s time to sit on the couch, barefoot, watching old Jamie Oliver episodes, because every time I find a new inspiration, a smiling idea, the enthusiasm of small things, I feel urged to go out to the grocery store to buy all the ingredients I need to try a new recipe. 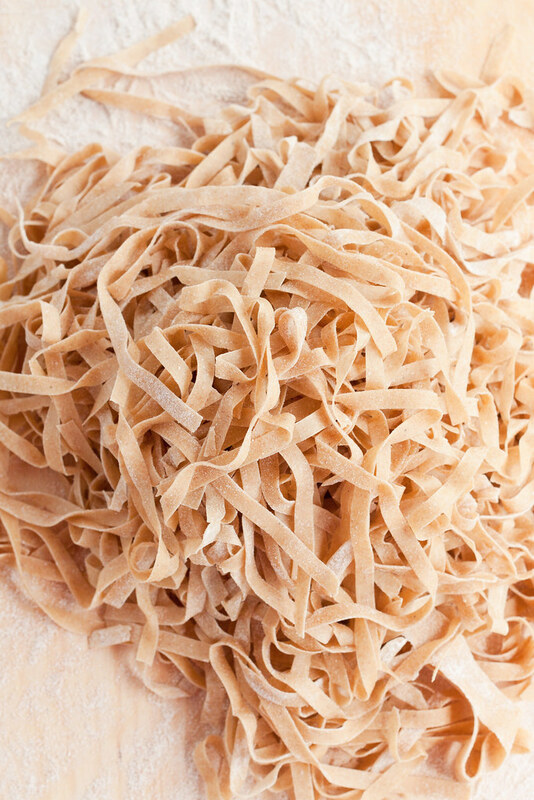 It’s time to make fresh pasta, because it is a ritual that relaxes me, makes me spend some valuable time with my thoughts, talking softly with the sheets of pasta, stroking and stretching them until they become paper-thin, almost transparent. 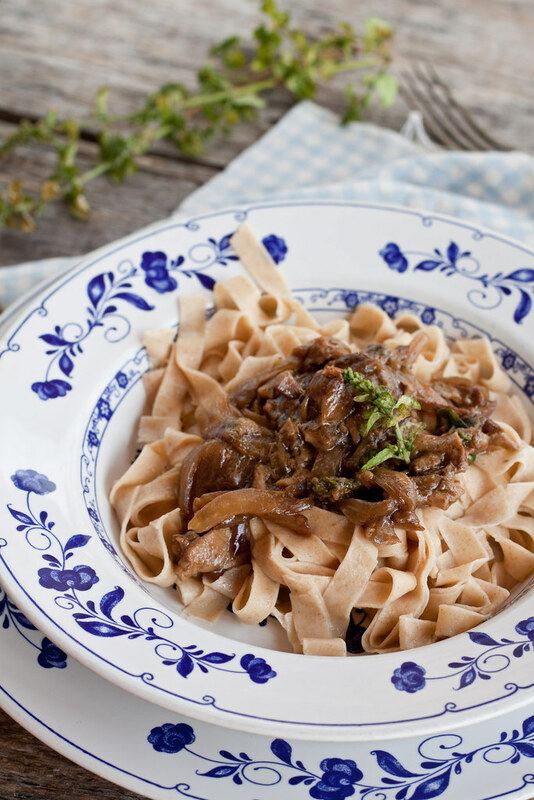 I got the inspiration for this post from Emiko’s words and from one of her mouth-watering and hearty recipes: she chose wonderful fresh mushrooms, I used dried porcini. But there is one ingredient that binds tight our recipes… or maybe two. The first one is nepitella, the calamint, a fresh herb we really love in Tuscany, a perfect match with mushroom, a wild mint with the pungent aroma of oregano. The second one is a strong friendship, born around a table in a cold winter evening. A friendship that I am perfectly sure will continue even when in the middle of the table there will be several oceans and a 30 hour flight! 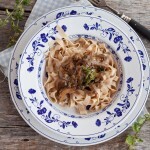 I needed a generous bowl of steaming and well seasoned spelt fresh tagliatelle with calamint and dried mushrooms dressing to bring out the emotion of the first post, when each recipe was a discovery, every written word a drop of real life. I needed the caring words of a friend, said to make me stop. Breathe. Look around and start again. Soak the dried porcini mushrooms in warm water for a few hours. Slice thinly the onion and put it in a large pan with a tablespoon of olive oil, a clove of crushed garlic, a sprig of calamint, the squeezed and roughly chopped dried mushrooms, salt and freshly ground black pepper. Cook over medium heat for about 10 minutes, adding a few tablespoons of the mushroom water - I've poured in about ten tablespoons to get the creaminess I was looking for. Sift the plain flour with the spelt flour, place it on a wooden flat surface and make a well in the centre. Whisk the eggs with a pinch of salt and pour them in the well. Pour in the extra virgin olive oil. Work the flours and the eggs with a fork, then start kneading the dough, pouring the mushroom water little by little, until the dough gets soft, elastic and it doesn’t stick to your fingers anymore. You’ll need about 10 minutes. Let it rest for about 30 minutes at room temperature. Now, roll the dough: you can use a classic rolling-pin or the pasta maker. 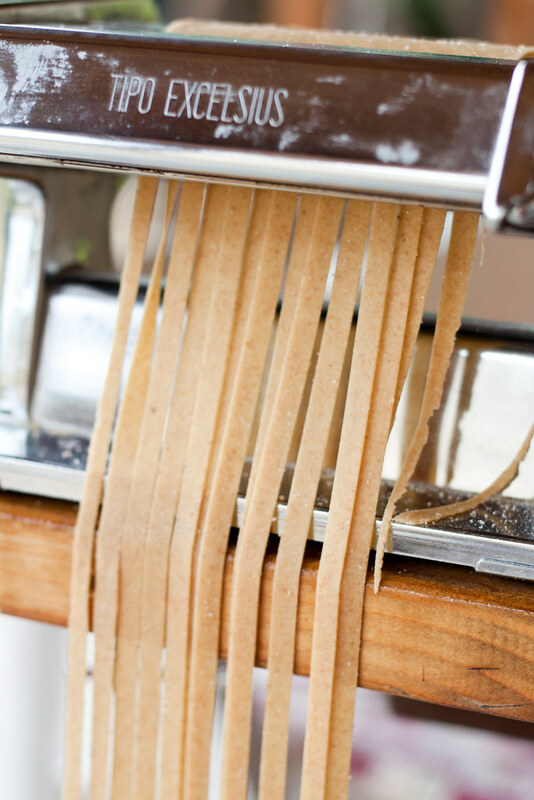 The most important thing, either you’re using the rolling-pin or the pasta maker, is to keep rolling and flipping and rolling and flipping until you get a dough that is paper-thin. Let the pasta sheet dry out for about 15 minutes. Guide the pasta sheets through the cutting roll of the pasta machine, or roll the sheets loosely and cut with a sharp knife. 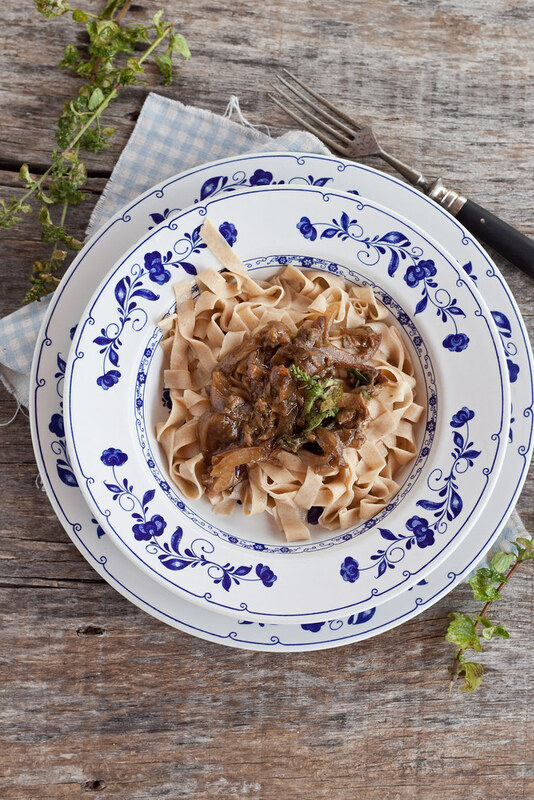 Boil the tagliatelle for just a few minutes in a large pot of boiling salted water, drain the pasta and toss it in a large pan with the mushroom dressing and some fresh calamint. Still hungry for fresh pasta? 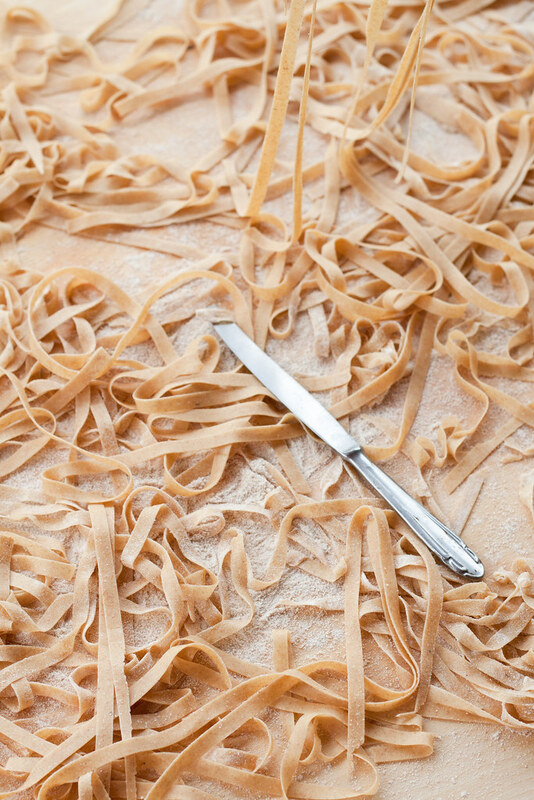 You know I am a fresh pasta maniac, so just choose an Italian region, and you will learn something more of their culinary traditions simply by rolling out a thin sheet of pale yellow fresh pasta, with the unique smell of fresh eggs and semolina flour. and how not to mention the Emilian tradition, with my friend Valeria’s sumptuous cappelletti or Elisa’s simple cappelletti di magro, without meat, eaten during a lent period. The flavors of that beautiful pasta dish must be so warm and wonderfully nutty. Beautiful pasta! I am crazy about pasta and all sorts of combinations with it just as I’m crazy about porcini. We like to go pick them in the woods. I still have some dried porcini left from the past season, but this autumn there still are none because of this dry season. We need a lot of rain and then some sunshine in order for the porcini to grow. Wow, its certainly nice to see that you made the pasta and then came up with a beautiful recipe. Such a beautiful post, both written and in pictures. I love the rustic feel of the mushrooms. So beautiful and simple. I like how you call it Mushroom Dressing…not heavy like a sauce at all. Very inspiring! Fresh noodles are a thing of beauty. Thanks for sharing this jewel of a dish. I am a little hesitant trying mushroom sauces, I dont attain perfect consistency most of the time. But I think I can pull this off. Thanks for a good recipe post! What a beautiful dish and sentiment….I completely agree – me time is invaluable! 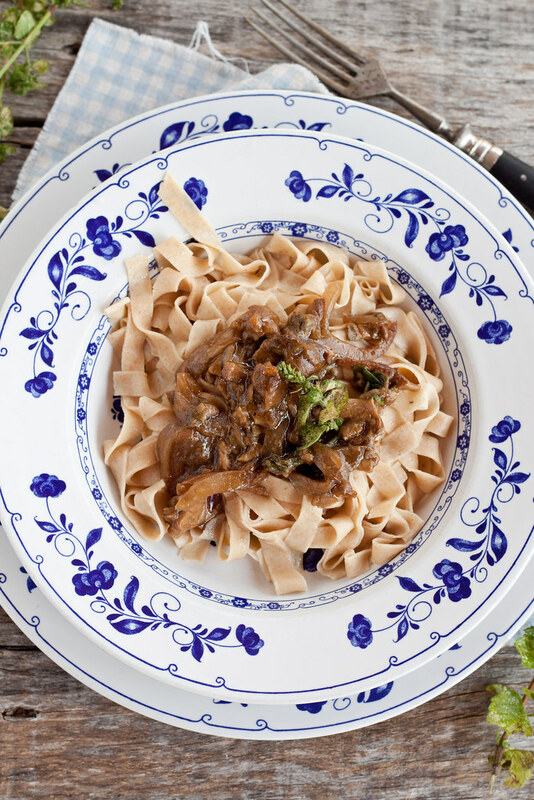 | love mushrooms and i love pasta, great combination, also never tried fresh mushroom, and this spelt is new for me. i find the recipe great and delicious. You really are true Giulia! Don’t spread yourself too thin!! Wise words. Thanks Emiko! Here it is surprisingly warm (ish) considering Scottish standards but as soon as the weather changes – and it will very soon – this dish will be on the top of my list! By God this post is so beautiful! I’ve yet to make my own pasta, I’m afraid if I ever start I wouldn’t stop. My bottle of dried porcini mushrooms is treated like gold (they’re expensive commodity here in Singapore) and I’ve used half the other day to make the most amazing chicken with rice. Now I think it’s time to use the other half with some fresh pasta. Very fabulous post! 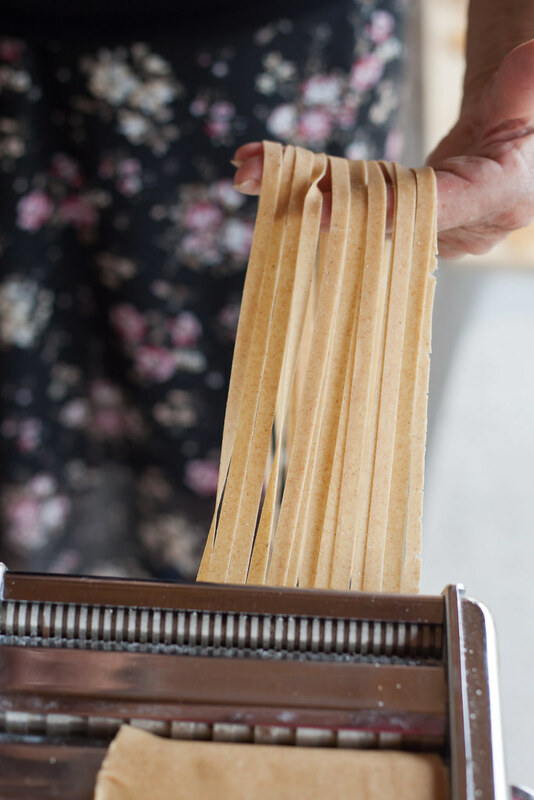 I love making my own pasta, and do it often with my mother and my grandmother. Its a wonderful project to do with the family. I love this recipe. Dried mushrooms are so versatile (I recently posted a recipe with porcini salt), but I’ve never seen or made anything like this. Really going to try it, bookmarking it now! this looks really delicious. I don’t have a pasta machine, nor the time to make it, but would love to make this, maybe with bought pasta or from the fresh pasta store. I love the way your sauce looks creamy and delicious. When i make it just from dried porcini it comes out kinda dark and dry. What is your trick? I want to thank everyone for your kind kind words! Alexandra, I think the trick is onion, it gets soft and creamy and melts with dried porcini! That is sound advice your friend has offered, it’s so easy to get swept up living life at fulls peed that we start to lost the reason why we are going at top speed to begin with.